IMAN hosted its second CommUNITY Café of the year on March 30th at Chicago’s Harold Washington Cultural Center. 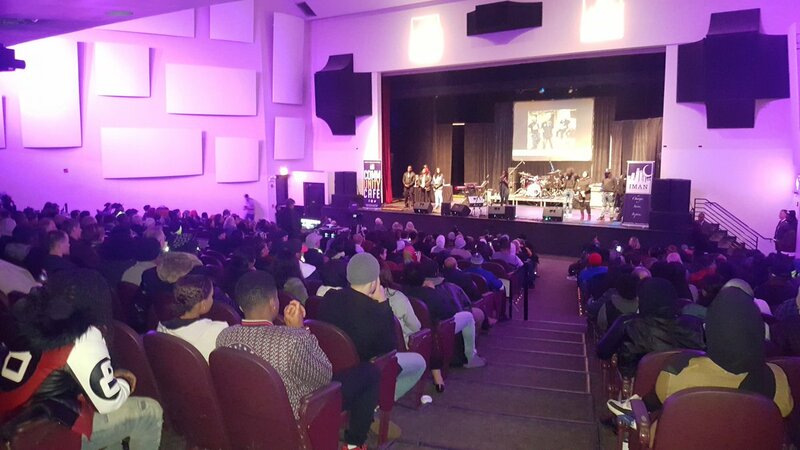 Over 400 attendees enjoyed CommUNITY Café: Celebrating the Sacred Cypher, a night filled with healing, spiritual unity and diverse and unforgettable artistic expressions. CommUNITY Cafés are intentionally intersectional gatherings that bring artists, organizers and other community members together. This most recent Café took on global significance in light of the tragic events in New Zealand and Mali. The evening began with a lively Café Hour with several local vendors and a special “beat making station” sponsored by Solidarity Studios. Guests enjoyed several performances by nationally renowned artists with deep connections to IMAN’s work. Grammy-nominated songstress (and IMAN Roster Artist) Maimouna Youssef headlined the evening with her powerful vocals and unique blend of hip-hop, R&B and tribal sounds. Zeshan B–who recently performed on Late Night with Stephen Colbert– moved the crowd with soulful ballads including “Cryin’ In the Streets” and K Love the Poet rounded out the evening with inspiring spoken word performances rooted in healing. Grandmother Walks on Water–Maimouna Youssef’s mother–wove traditional indigenous vocals into her chilling performance, and the audience was asked to reflect on the equally disheartened violence happening on local streets. During the evening, IMAN formally announced the Sevyn Ward Trust, a special fund intended to support a strong future for the daughter of slain Green ReEntry cohort member Steven Ward. Chicago’s Mayor-elect Lori Lightfoot also took the stage Saturday evening in a gesture of spiritual solidarity, making a commitment to help fight the destructive forces that pit communities against one another, and to allowing us to hold her and her office accountable to working with us to form equitable solutions to some of Chicago’s toughest social justice challenges. This incredible event would not have been possible without the generous support of our partners at: The Doris Duke Foundation for Islamic Art, Pillars Fund, and Lyft who provided complimentary rides to and from the venue. We were honored to have such a beautiful crowd in place as we both mourned and uplifted the lives of those lost in New Zealand, Chicago, and around the world in senseless violence. Stay connected to IMAN’s Arts & Culture work by following #IMANArts on Twitter and Instagram. To get involved, please contact arts@imancentral.org. This entry was posted in Arts & Culture, News by IMAN Staff. Bookmark the permalink.